Whitney Vickers | Fairborn Daily Herald Fairborn Mayor Dan Kirkpatrick proclaimed October as Pink Medic Month during the latest meeting Oct. 2. Firefighters and Paramedics John Howard and Scott Six were present to accept the proclamation. Council members also dawned shirts promoting breast cancer awareness. FAIRBORN — In recognition of Breast Cancer Awareness Month, Fairborn Mayor Dan Kirkpatrick proclaimed October as “Pink Medic Month” throughout the community. Firefighters and Paramedics John Howard and Scott Six were present to accept the proclamation, saying that the goal of the pink medic is to raise money for cancer. Council members dawned pink shirts to support the cause. “According to the Ohio Department of Health, female breast cancer was the leading cause of cancer incidents in Greene County from 2010 to 2014, accounting for 15.6 percent of all cancer cases,” Kirkpatrick said as he read the proclamation during the Oct. 2 regular council meeting. During that same period of time, an average of 22 Greene County women per year lost their life to the disease, the Ohio Department of Health reported. Kirkpatrick added that for more than five years, the Fairborn Professional Firefighters Local 1235 has partnered with a number of community businesses as well as the Circle of Victory, Pink Ribbon Girls, Greene Giving, Wright-Patterson Professional Firefighters Local F88, Xenia Professional Firefighters Local 68 and Beavercreek Professional Firefighters Local 2857 aiming to raise awareness of breast cancer. The proclamation offers an opportunity to recognize the pink medic. 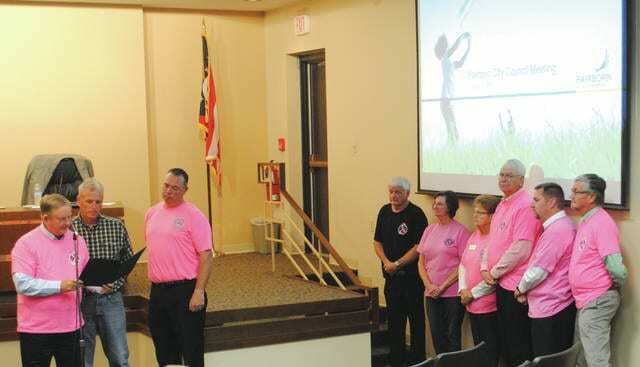 “In support of the hard work and service, the Fairborn Professional Firefighters Local 1235 provides to the citizens of Fairborn and Greene County as they turn up the heat on cancer,” Kirkpatrick said as he concluded the proclamation. https://www.fairborndailyherald.com/wp-content/uploads/sites/50/2017/10/web1_DSC_0193.jpgWhitney Vickers | Fairborn Daily Herald Fairborn Mayor Dan Kirkpatrick proclaimed October as Pink Medic Month during the latest meeting Oct. 2. Firefighters and Paramedics John Howard and Scott Six were present to accept the proclamation. Council members also dawned shirts promoting breast cancer awareness.